DignityFirst Health at Home is a well-established Colorado company that has served the Greater Denver Region for many years. We adhere to the highest standards of care established for our industry by organizations such as the Society of Certified Senior Advisors, the Home Care Association of America, and the Home Care Association of Colorado. At DignityFirst (formerly LivHOME Colorado), we leave nothing to chance. Our credentialed care management team, with education and experience in nursing, social work, gerontology, and healthcare administration, work with each client and family every step of the way. The initial comprehensive clinical assessment and Plan of Care, plus ongoing supervision of Caregivers, are FREE of charge. A DignityFirst professional is available 24 hours a day, 7 days a week. 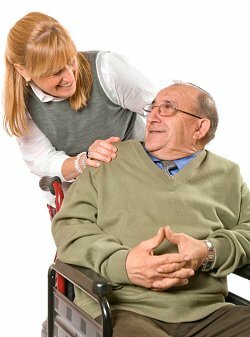 Caregivers are nurse assistants, medical assistants, and home health aides with experience – often certification – in conditions such as dementia, Parkinson’s disease, multiple sclerosis, stroke, diabetes, cancer and other chronic illness. They are company employees – not contractors -who are drug tested, background checked, fully insured, and extensively trained. Our Care Managers will recommend various state-of-the-art technology solutions to minimize caregiver labor expenses while simultaneously enhancing quality of life, safety, and maximum independence for clients. When someone receives a diagnosis of Alzheimer’s or a related dementia, most seniors and their families don’t know what to expect or how to begin the process of planning the required care. DignityFirst Health at Home is an expert in the care for those with Alzheimer’s or related dementias. Our team has extensive dementia care training and we use a holistic approach that involves good communication, managing behaviors, enhancing the quality of life, and developing a plan of care that is modified as needs change. DignityFirst Health at Home provides a wide variety of holistic and wellness oriented services. Our goal is to help our clients live life to the fullest level possible. If you are caring for elderly parents at a distance, you are not alone. DignityFirst Health at Home can ensure that your loved one will get the care you would give if you were there. From our trained Caregivers to our Care Managers and our plan of care documents, we have enabled thousands of seniors to stay at home safely and given family members peace of mind. A growing number of older adults are responsible for the care of their mentally, physically, or developmentally disabled adult child. As these parents age, they become less able to provide direct care for their children. DignityFirst Health at Home has a solution. In the same way that we approach eldercare, we can help the senior and the family with a plan that specifically addresses the special circumstances of aging parents with dependent adult children.